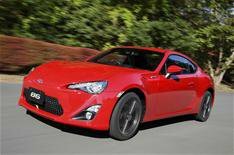 Test drive the Toyota GT 86 | What Car? Want to drive the Toyota GT 86? Then sign up now for an exclusive test drive of this hotly anticipated sports coupe with What Car? Four lucky readers will join the What Car? team and head to France for a day of driving on some of the countrys most scenic roads. Successful applicants will need to get to, and from, Folkestone, but well take care of the rest. We've already given What Car? readers a static viewing of the Toyota GT 86 (see the video below), and we think the car is nothing short of inspirational. Will you agree when you take it out on the road? If youre free for an early start on Saturday, June 2, 2012, and want to see whether the hype surrounding the GT 86 is justified, get in touch now with the following details. If youre selected, well also need you to send us a scan of all parts of your driving licence, and your passport details.